Let's start off with the negative aspect of the movie, which I personally see very little of, is that this movie has been criticized as "hard to follow." This is one of the most erroneous and telling criticism of the person saying it because whoever says this has the attention span of a squirrel. The film is supposedly hard to follow because of the fact that there are no explanations or exposition expelling who "Control" is or what the "Circus" is. And apparently there's no way of knowing when you're actually going into a flashback, and a prominent player within the story is never explicitly shown, only talked about in whispers. However, there's a very obvious visual aid that you have used which can help you keep track of things especially, when figuring out during what time period you're in. Now, for the good parts. This is a really atmospheric movie; it not only tells a story, but sets a very specific mood that stays with you for days after. The movie has a very bleak palette, always showing you greys and muted colors, and the only times where there were bright colors, it was brief and barely breaks up the feeling. The large ensemble cast is the reason for much discussion seeing that you have people ranging from Mark Strong and John Hurt, to new-comers like Tom Hardy, and they were all wonderful in their own ways. Each of them exemplified the toll of what the spy lifestyle can have on a person. And no one shows this as much as Gary Oldman's Smiley who is unceremoniously made to "retire" and has to deal with quite a few consequences from his not-so glamorous profession. This is probably the best performance I've seen out of Gary Oldman who so often has a tendency of being put in the background in favor of bigger actors or whose performances can be extremely campy. Much like the Driver from DRIVER, Oldman's Smiley is a man that is very careful with his words and only in certain times do you see him say too much, but when he does, you know it's important. Mind you, this movie is a bit of a hard sell for a lot of people. 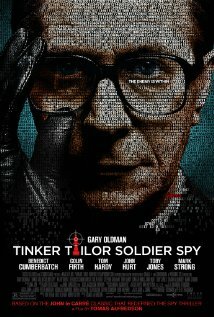 It is a spy movie that focuses on the mundane parts of being a spy. Also, there's not enough tension in this movie to even have it be considered a thriller. The great thing about the movie is its focus isn't even on finding the mole, but on the characters showing the effects of spy life and what it can do to people. This is very spoilery material, but if you keep this in mind before or after seeing this movie, a lot more layers open up within the story, and the deliberate actions by the characters will make more sense. I'm really bummed that I didn't get to go to a screening of this movie to have it be in time for my top ten list of 2011. It is smartly written with a good mystery that does take a bit of a backseat to the themes of paranoia, and it is so well shot and acted. I enjoyed every minute of it.